Sunsets over the Arabian sea! Arabian sea (Sindhu Sagar) a sea located in the North Indian ocean, lies around many countries that include India, Pakistan, Iran, Oman, Yemen, and Somalia. There are many names given to the Arabian sea like Arabikkadal, Sindhusagaraha, Baḥr al ‘Arab, Arabi Samudra and Darya-ye ‘Arab. Arabian sea is usually less active than its arch-enemy the Bay of Bengal, however during the last few years it is getting opposite. Every year before the onset of the South-West monsoon that is 15 April to 25 June and also after its withdrawal that is 15 September to 15 December, there is always a distinct possibility of the tropical storm to develop in the Arabian Sea. The chance of tropical storm moving towards the Indian state of Gujarat is far more greater than the sultanate of Oman or Pakistan during pre-monsoon period. 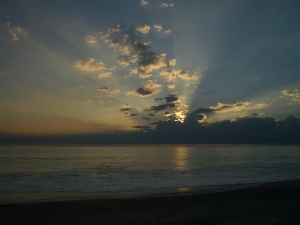 While during post-monsoon, Tropical storm usually affect the horn of Africa. Low pressure in the Arabian sea – Will it intensify? An upper air cyclonic circulation on October 20 was seen persisting over the Indian state of Kerala. On October 22, the upper air cyclonic circulation moved to Lakshadweep and remained stationary over the same area. It was not untill on October 25 that the upper air cyclonic circulation intensified into a low pressure area at 1010 mbar. The low pressure formed in the south-eastern sector of the Arabian sea. GFS (Global forecasting system) and some international models do hint of a tropical storm, some suggest a minimal tropical storm (50 mph – 60 mph) forming in the Arabian sea during the first week of November. Having said that the Joint Typhoon Warning Centre (JTWC), Naval Research laboratory (NRL) and Fleet Numerical Meteorology and Oceanography Center (FNMOC) are also monitoring the low pressure area for potential development of tropical storm. All these centres are led by the U.S Navy. The system may at least attain depression status on the Indian meteorological Department (IMD) scale as far as the conditions in the Arabian sea are concerned, the easterlies would force the low pressure to move away from the coast of India. The weather system may move in a westwards direction during its early life and may change direction afterwards. But the westerlies and dry winds do not give much chance for the system to intensify easily. However as it is being observed, it may not be a very long-lasting system like many other tropical storms of the Arabian sea. 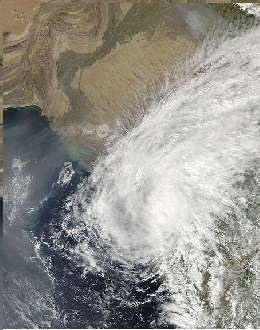 The previous tropical storm on the Saffir–Simpson Hurricane Scale (SSHS) that formed in the Arabian sea was tropical storm 01A. This tropical storm was although forecasted to become a strong tropical storm but high pressure over northern parts and dry air from north-western parts made it difficult for the storm to intensify further. Tropical storm 01A formed on June 11 and dissipated the other day but its remnants remained stationary near Saurashtra, the coast of Gujarat after finally dissipating in few days. Tropical storm 01A was a depression on the Indian Meteorological department scale (IMD). November – Depression/cyclones in the Arabian sea! Cyclone Phyan: Last cyclone of of November! 1970: November 22 – Cyclonic storm affected Somalia on November 30 as a remnant low pressure. 1980: November 12 – A tropical storm dissipated over north-eastern Arabian sea without affecting any land. 1982: November 4 – A category-1 hurricane made landfall Veravel, India on November 7. The storm had winds upto 95 mph. 1985: November 9 – A tropical storm wandered into the central Arabian sea and dissipated due to high wind shear on 11. 1990: November 16 – A tropical storm (Deep depression) affected Indian coast. The storm was 500 km away from Bombay. It had winds up to 40 mph. 1992: November 3 – A category-1 hurricane hit the western coast of India, its originated from the Malay Peninsula. It had winds up to 65 mph. 1992: November 30 – A strong cyclonic storm formed south of India, it dissipated after four days. It had winds upto 60 mph. 1993: November 8 – A category-1 hurricane threaten the coast of Sindh, Pakistan. It killed some 630 people in the country while 200,000 people were displaced. It had winds up to 90 mph. It weakened before landfall due to intense vertical wind shear. 1994: November 15 – A tropical storm (cyclonic storm) made landfall over Somalia on November 19. It had winds upto 65 mph. 1997: November 2 – A tropical storm (Deep depression) formed near Srilanka and dissipated over central Arabian sea. 1997: November 4 – A tropical storm (Deep depression) made landfall over Somalia. It is clear from the above that since record keeping started these November storms do not affect Pakistan except for a storm in 1993 which was unusually stronger than any cyclone in this month since 1993. Tropical storms in this month usually move towards the horn of Africa or India’s western coast. No tropical storm in this month has affected Oman since 1990. So what does future holds for this low pressure area? any chances of rain in pakistan’s coastline ?? your blog is awesome, one of the best in the world. I can see you put lot of effort in compiling the data. Mean while the storm track is still towards Pakistan / Gujarat coast. Thank You Pradeep very much! MAXIMUM SUSTAINED SURFACE WINDS ARE ESTIMATED AT 20 TO 25 KNOTS. MINIMUM SEA LEVEL PRESSURE IS ESTIMATED TO BE NEAR 1005 MB. THE POTENTIAL FOR THE DEVELOPMENT OF A SIGNIFICANT TROPICAL CYCLONE WITHIN THE NEXT 24 HOURS REMAINS MEDIUM. Any chance for the storm to intensify into cat 1 or more?????? Walaikum assalam Sam… its a well-marked low that may reach depression status… while it may reach tropical storm status on SSHS..not expected to reach any category.. It lay centred at 1130 hrs IST of today, the 29th October 2011 near latitude 13.00N and longitude 62.00E, about 1400 km west of Mangalore (Karnataka), 850 km east of Socotra Island (Yemen) and 950 km southeast of Salalah (Oman) The system is likely to intensify further into a deep depression and move west northwestwards towards Gulf of Aden during next 72 hrs. any chance of this system effecting Karachi???? Will we get heavy rains or some showers or just drizzle? As of today, there are chances of rain showers..
phir uskay baad sardi shuru hojayegi? winter will start once a WD enters Sindh..
All Models including ECMWF, CMC, GFS, NOGAPS all predict the November 9th system in Arabian sea crossing Pakistan coast instead of Tamil Nadu Coast in India. This one appears to be a severe cyclone…. Yeah I saw that, they showed it first hitting Tamil Nadu but it appears to be moving into ARB an intensifying here…But way too early to talk about its future since the forecast has changed..
Karachi Taking a direct hit on this cyclone…..
high level clouds started coming from the south. Babar bhai will this storm intensify further? There is a chance of slight intensification further but after that cold waters will weaken it..